‘Now, what else do I need to get ready?’ Jessica asked herself. Hanging on the wall was a string of letters saying Happy Easter that Jessica had spent hours making from lots of scraps of wrapping paper. She decorated this with tiny bows. On the table was a vase of brightly coloured tulips which Jessica had persuaded her Mum to buy for her. Jessica was really pleased with how cheerful they looked. 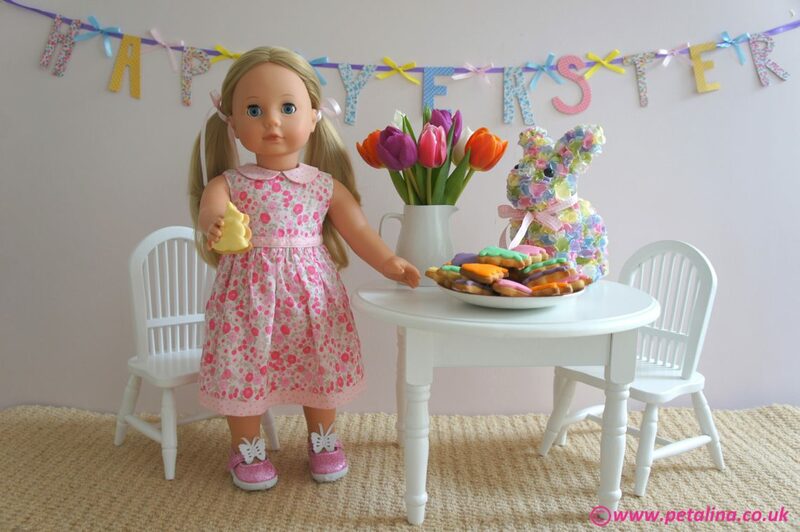 She had also remembered where she had put her glittery bunny decoration last year, so once again he came out to go on display and looked really sweet. 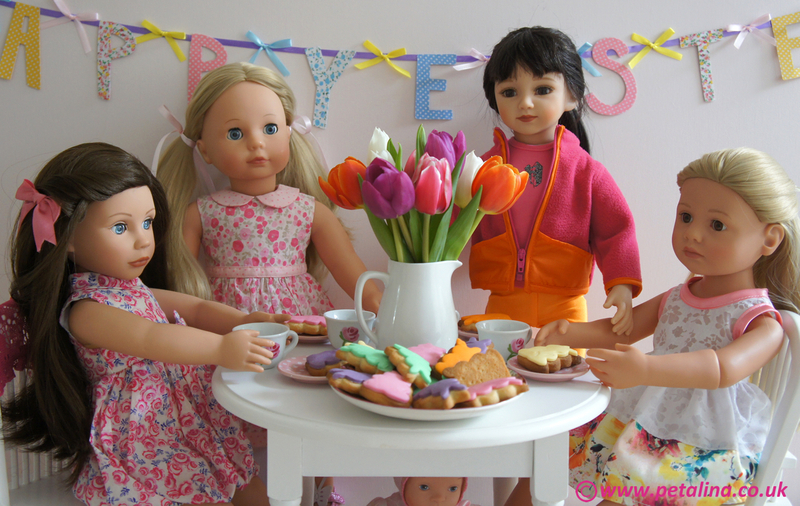 Then there were the biscuits so all Jessica needed to get now were plates and cups for her friends. Jessica sat down and contemplated how lovely the table looked. She was very pleased with her efforts. ‘Ding Dong’ went the door bell. Jessica rushed to see who was the first to arrive and it was her best friend Luisa. Luisa was very apologetic that she had had to bring her little sister Dita, but her Mum was helping Grandma with something important for a couple of hours so Luisa stepped in to help out. Jessica didn’t mind at all as she loved Dita to bits and said she couldn’t wait to play with her later in the garden. ‘Ding Dong’ went the door bell again. 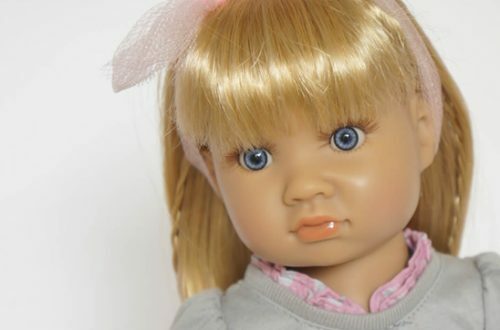 Jessica ran to the door and there was Bonnie, a new girl at school and Jessica had been made her buddy. 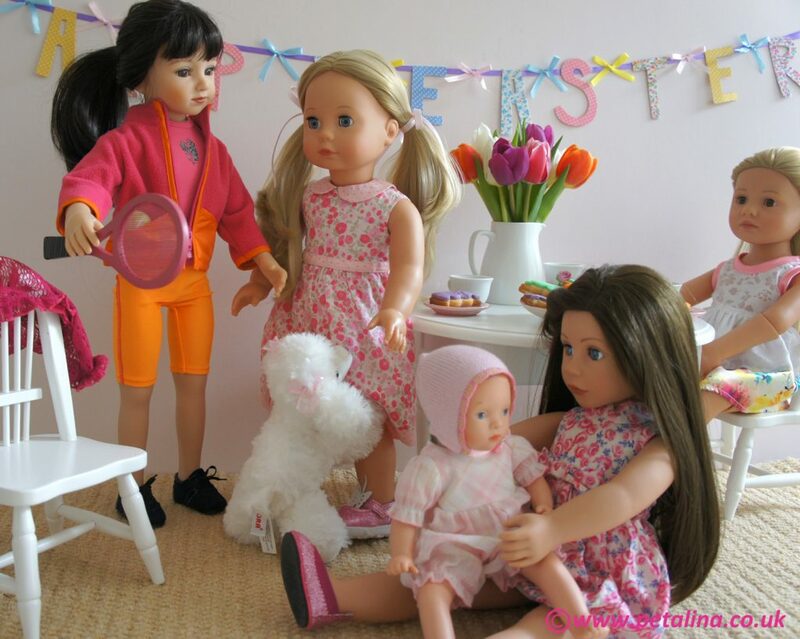 The girls actually hit it off so well that Jessica had asked Bonnie to come to her tea party so that she could introduce her to her other friends. Bonnie was a little nervous about going to the party as she was quite shy, but she needn’t have worried at all. Jessica gave her such a big hug to welcome her that she felt at home right away. 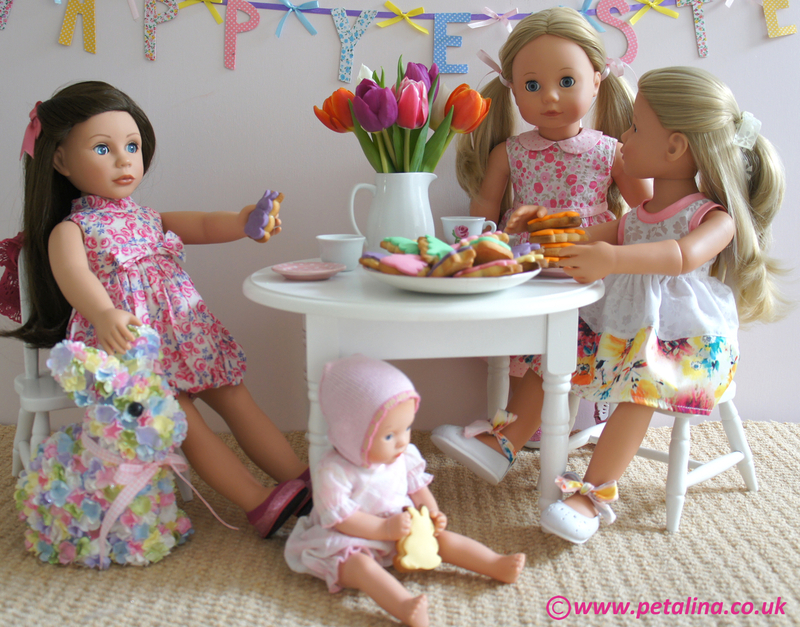 Jessica invited her two friends to sit down and offered them both a biscuit. First of all Luisa let Dita choose a biscuit and she took a yellow one. Then Luisa took an orange biscuit, and then another, and another and another! In fact she took all of them! ‘Luisa, I didn’t just make those just for you. They are for everyone to share!’ reprimanded Jessica. ‘But orange is my favourite colour and I didn’t think you would mind because I’m your best friend,’ answered Luisa, reluctantly putting three of the four biscuits back onto the plate. ‘Now that everyone’s here we can sit down and all have a drink. What would everyone like? We’ve got water, some strawberry squash and some sparkling apple juice.’ Jessica busied herself handing out drinks and they all gathered around the table and enjoyed lots of chatter and giggling. I wonder which biscuits were the first to go? Orange I think! ‘Has anyone seen Dita?’ asked Luisa, suddenly worried because she couldn’t see her little sister anywhere. The girls all stopped what they were doing and looked around. Bonnie heard some rustling from under the table. They all looked, expecting to see Fluffy chewing something up, but there was Dita surrounded by chocolate egg wrappers and about to devour another! ‘Oh no! 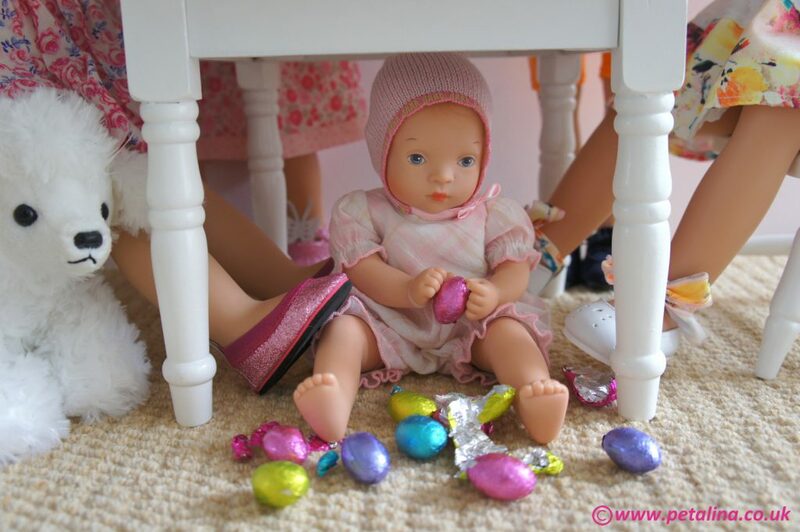 She’s found the chocolate eggs for the Easter egg hunt tomorrow’ gasped Jessica. ‘Dita, you tinker. Come here and let’s clean you up,’ said Luisa, having seen all the melted chocolate all over her sister’s face and hands. 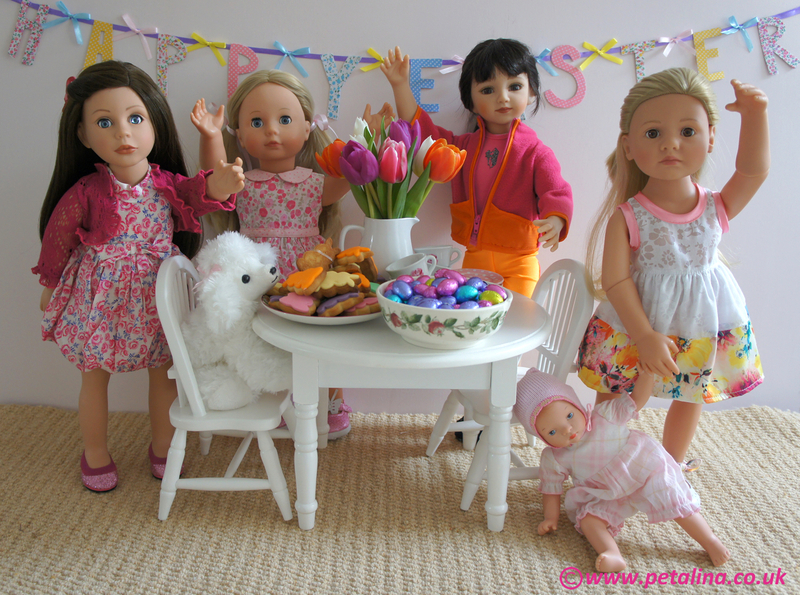 ‘To be honest I had completely forgotten about the chocolate eggs,’ said Jessica, ‘Let’s go and hide them in the garden ready for tomorrow before Dita eats them all!’ The girls all jumped up and waved to Jessica’s Mum. As the girls went out into the garden you could hear Dita moaning, obviously complaining because Luisa would not let go of her hand! First posted on Petalina’s original blog on 17/4/14. These are some of my most favourite photos ever. The recipe for the buttery biscuits can also be found on our blog. We used a set of cutters of the same shape but in different sizes so that the fondant icing could be cut out slightly smaller than the size used for the biscuits. Maru and Friends have arrived!